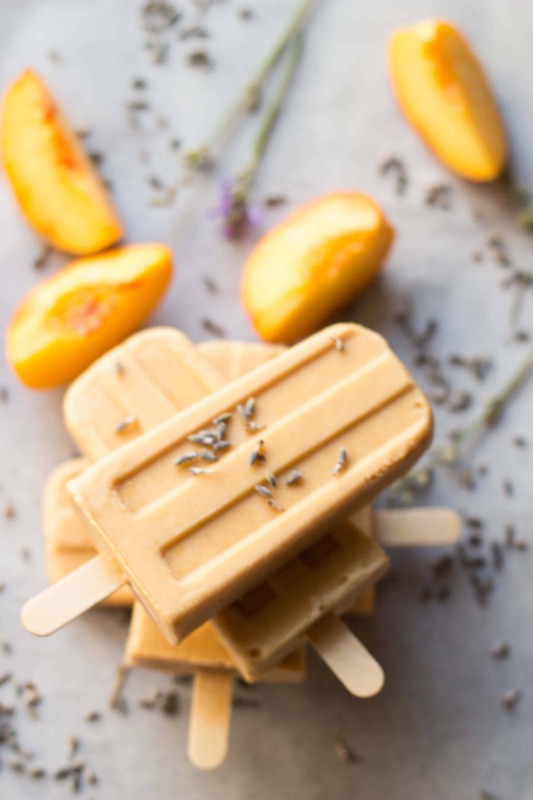 These pretty lavender peach popsicles pairs ripe summer peaches with floral lavender! They’re creamy and cold and perfect frozen treat for summer! We’re going to ITALY! In a month. For two weeks! For our 5 year anniversary. And my birthday! And when we booked our flights I fell to my knees and cried. Wept. Sobbed. Blubbered! I straight up ugly cried tears of joy. You see, it’s been a lifelong dream of mine to travel to Italy, and I spent a good part of my life thinking it was never going to happen. I’m still in disbelief that it’s actually going down. Is this real life? In fact, I’m so excited that it’s actually becoming a bit of a problem. It’s nearly impossible for me to get any work done because I can’t stop endlessly daydreaming about our trip. 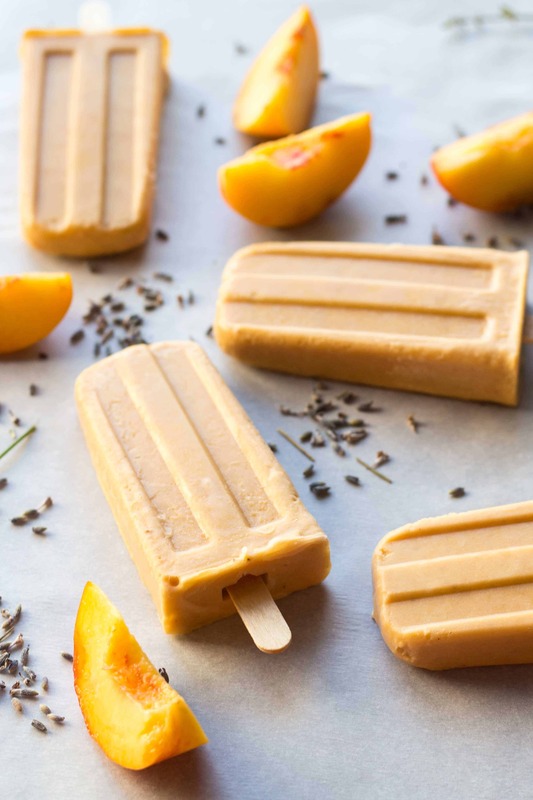 Every time I open my browser to start writing about these stunning peach and lavender popsicles, my attention gets diverted to an agriturismo in Tuscany or a restaurant in Bologna. Sure, there’s this food I photographed for this post, but what about ALL OF THE FOOD IN ITALY?! I have plenty of time to clamor on about my Euro adventure, so lets get to talkin’ ’bout these pops! That’s what you came here for anyway, right? We’re at the peak of peach season right now in New Jersey, and every week I’ve been lugging home bushels from the farmers market to fill up my freezer. Having a little taste of summer in January is what helps me get through the doldrums of winter – you should try it! 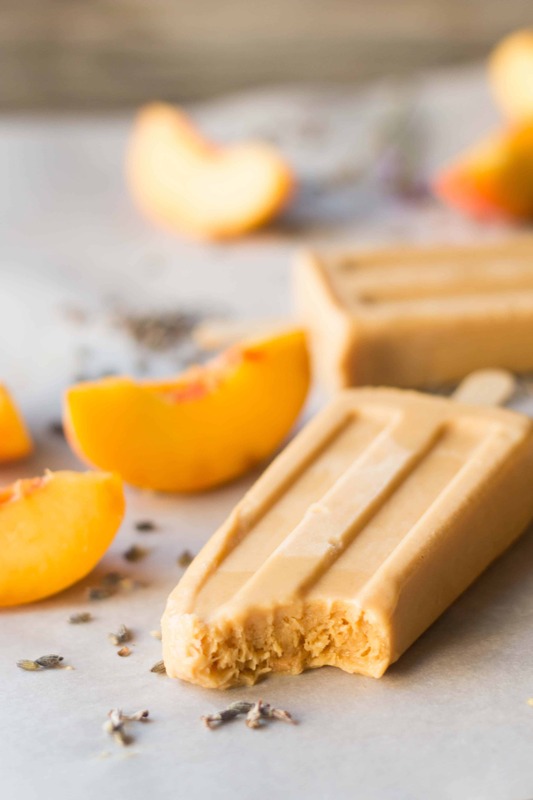 Made with protein-packed Greek yogurt, sweet-tart peaches and floral lavender, these Lavender Peach Popsicles are more like Lavender Peaches and Cream-sicles. Does anyone else think of that 112 song any time they hear those words spoken together…? Know what I mean? Peaches and cream? Lavender is a gorgeous aromatherapeutic herb that has a calming, relaxing scent. But it can be a little funny to cook with. Not funny Ha-Ha. Funny weird. 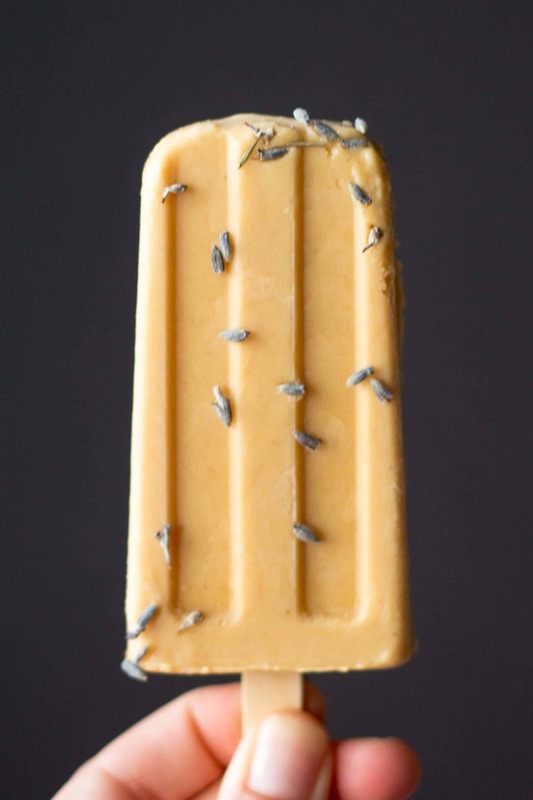 Used in just the right quantity, lavender gives a lovely floral quality to food, but if you add even just a little bit too much, it will straight-up taste like soap. I tasted a lot of soap as a kid (which, for the record, did nothing for my potty mouth), so it conjures up bad memories of getting punished. No one wants to eat a soap-sicle. The lesson? Always exercise restraint when cooking with lavender, and never wash your kids’ mouths out with soap. It doesn’t work. The other lessons? These popsicles rule. Italy is going to rule. And YOU, my loyal readers, rule the most. xo. Have you been to Italy? 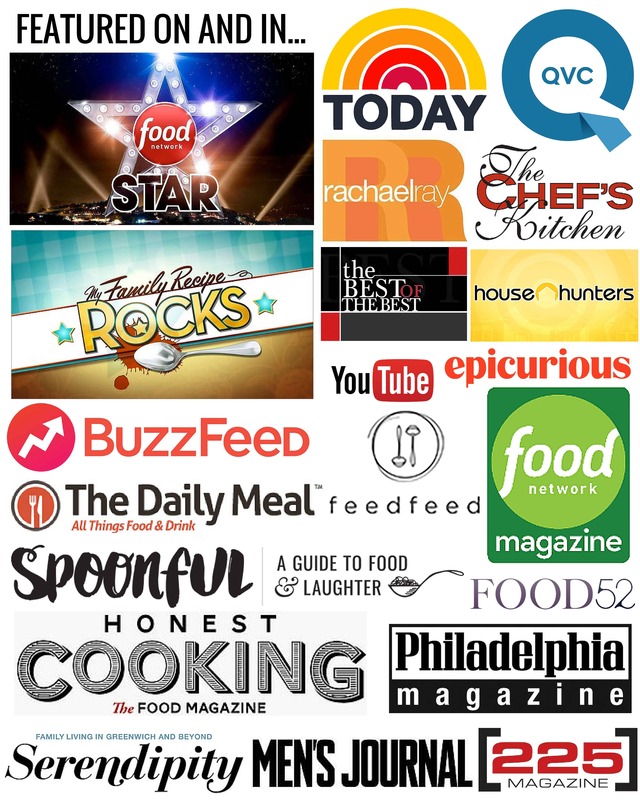 Do you have any tips, must-see-sights or, more importantly, must-eat-eats?! Leave a comment and let me know! Sweet, tart and slightly floral, these pops are soo refreshing on a hot summer day! Soak 8-10 popsicle sticks (depending on your popsicle mold) in water for about 10 minutes, remove, then place in the freezer along with the popsicle mold while you prepare the other ingredients. Bring a large pot of water to a boil and prepare an ice bath. Score a large X in the bottom of each peach and submerge them in the boiling water for about 30-45 seconds, then drop them into the ice bath. Once cooled, the skins should slip right off. Peel, remove the pits, and cut into chunks. set a fine-mesh strainer over a bowl and strain, pressing on solids to extract the purée. Cover the mixture and chill until it's nice and cold. Remove the molds from the freezer and divide the mixture evenly. Cover, then insert the popsicle sticks. Freeze until firm- at least 6 hours or overnight. To release, dip bottoms of molds into hot water for 20-30 seconds, and they should slide right out. Serve immediately, or wrap tightly and freeze for later. *I always use full-fat Greek yogurt since it's what I keep on hand. 2% or fat free will both work fine. Mmm mmm mmm! Thanks for another delicious recipe! Wondering if I can use my own lavender flowers or not. Any thoughts? Also, I don’t know if you wrote about vanilla in the past, but what is your fave to use? I’ve had several different types, and LOVE Mexican vanilla but don’t know they we can still get it here. Looking forward to hearing about your Italy trip, too!! You can most DEFINITELY use your own lavender flowers. I caution people to not use flowers that have been treated with chemicals, but I know that yours have NOT! I don’t know if I have a favorite vanilla, or if I’ve even tried them all. I don’t think I’ve had Mexican vanilla, at least not to my knowledge. I’ve had bourbon, Madagascar, and Tahitian, all I’ve liked very much. What an awesome combination, these look incredible. Can’t wait to try! Super jealous about Italy too, have a fabulous trip! Thank you so much! I hope you love them as much as I do. These look delicious! I’ve paired blueberry with lavender before, but never peach, and I’m looking for a new flavor to try for these humid VA summer days. Thanks!! It’s such a nice combo, gives the blueberries a run for their money for sure! These look impossibly classy and undeniably delicious. Beautiful work! Ahhhh!! I’m just giddy thinking about it. Where are you going?? And thanks for the compliment on my pics – you’re a pro, so it’s a super compliment!! Italy is fan-freaking-tastic–we went to Piemonte for our honeymoon and basically spent a week hanging out in our little spa town, walking around the countryside (including sneaking into a vineyard), and eating and drinking amazing food. We did take a little day trip to Turin so if you’re going to be up in that part of the country, check it out. It’s tourist-friendly but not tourist-overrun. Added bonus–you’re going to find Barolos everywhere, and probably at much lower prices than you’d find here! These pops look great, and if my freezer wasn’t overrun with frozen chicken carcasses and other meats I’d feel compelled to get some molds and make these right away! Thanks for the info!!! Your honeymoon sounds like it was a dream. we’re actually headed to Turin for our first two nights where we’re meeting up with a friend and staying at his sister’s house! I’m so excited to have some local tour guides. I have a feeling Italy is going to be full of little “added bonuses”!